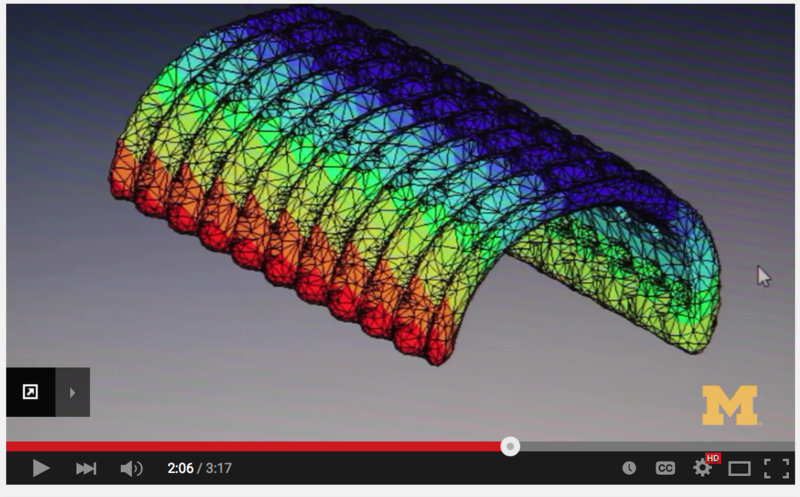 The additive manufacturing and rapid prototyping market has seen impressive growth over the past five years. It is worth nearly $4 billion, according to a 2015 report by Capstone Partners, with the medical and dental sector comprising 15% of the entire market. The industry as a whole experienced a 22.6% compound annual growth rate from 2010–2015 and is anticipated to hit $20 billion by 2020. Additive manufacturing processes enable rapid prototyping and are becoming of increasing interest in the medical device industry. 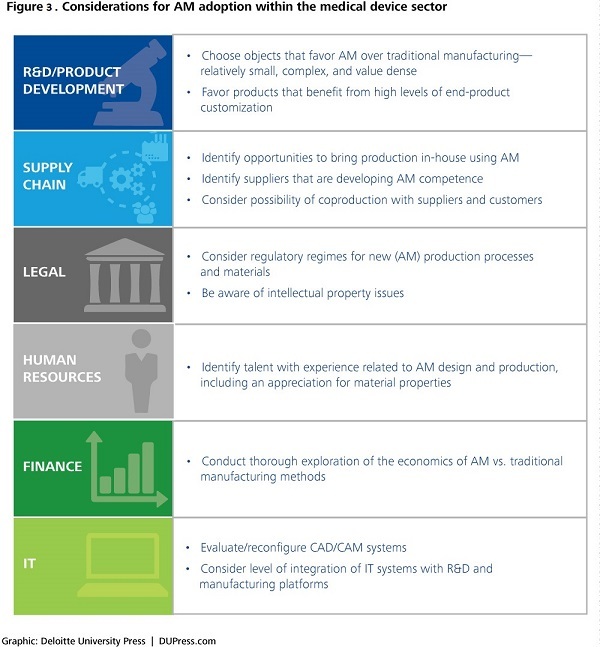 From dental implants and patient-specific devices to 3-D printed surgical aids, additive manufacturing can help companies accelerate the product development and manufacturing process and simplify their supply chain. However, there are several constraints related to the biomaterials currently used in 3-D printing, from both the perspective of strength and biocompatibility. Enter biofabrication, a concept that sprouted from the regenerative medicine movement, according to Jos Malda, Ph.D., associate professor in the department of orthopedics at University Medical Center (UMC) Utrecht in the Netherlands. Malda leads the Utrecht Biofabrication Facility and was recently elected president of the International Society for Biofabrication. 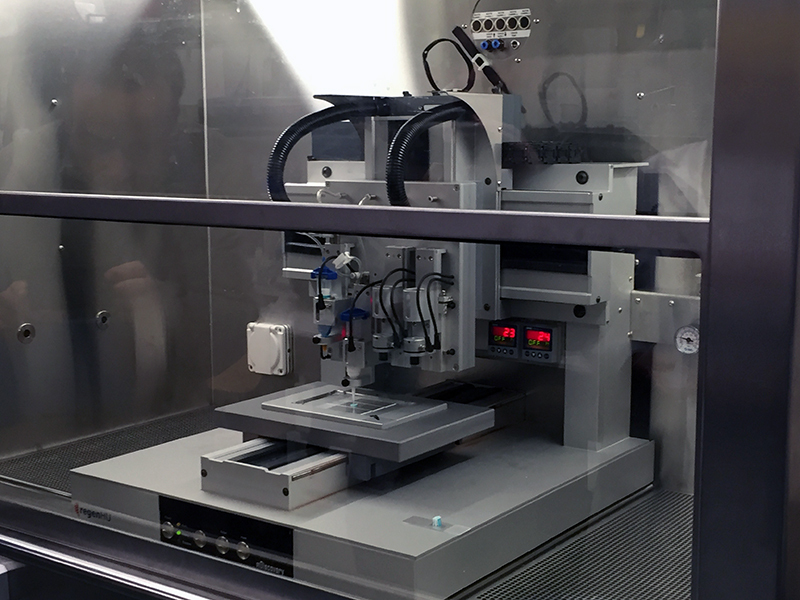 Simply put, biofabrication is the 3-D printing of biological tissues. The manufacturing technique considers the biological, physical, and chemical requirements of the body, bringing together several different disciplines. Its promise extends from repairing damaged tissue to more complex drug delivery applications. 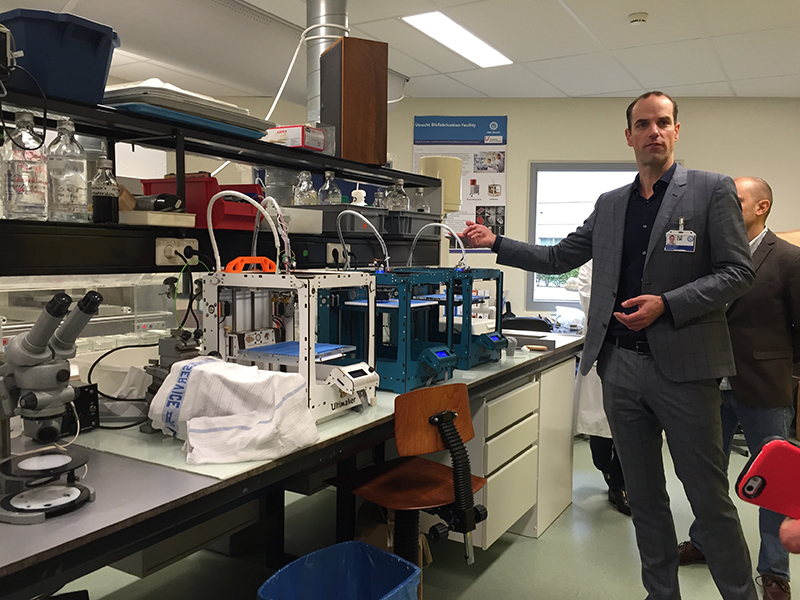 Jos Malda, Ph.D., leads the Utrecht Biofabrication Facility in the Netherlands. Students working at the state-of-the-art center are researching development methods to reinforce hydrogels to make them stronger for implantable applications. As the popularity of 3-D printing continues to grow, the biofabrication movement is gaining steam, especially due to the current limitations of materials used in additive manufacturing. The bio-inks used must be strong and facilitate tissue formation and regeneration in vivo; thus far, the most promising of the bio-inks are hydrogels, says Malda. Current research is examining development methods to reinforce hydrogels to make them stronger to enable applications from cartilage repair to replacement joints. With the significant potential of the field of biofabrication in mind, last year Utrecht University introduced the world’s first master’s degree in biofabrication, which it developed with university partners in Australia (Queensland University of Technology and the University of Wollongong) and the University of Wüerzburg in Germany. As part of the two-year program, students take one year of courses at Utrecht University and UMC Utrecht and conduct their second year of studies and research work in Australia. In the United States, the National Science Foundation (NSF) and other research organizations are quite active in support of advancing biofabrication as a viable future technology in medicine. Among the many grants it has awarded to research and education in this area, the NSF established a continuing grant, the Integrative Graduate Education and Research Traineeship award, for a training program in the field of biofabrication at Worcester Polytechnic Institute (Worchester, MA) where Ph.D. students conduct mentored lab research both domestically and internationally, and participate in entrepreneurial training with the goal of creating next-generation innovative engineers in the industry. The program also aims to address the current issue of biomaterial rejection in the body. Thus far nearly $2.4 million has been awarded as part of the grant. As industry looks ahead to the realistic possibilities of biofabrication, industry stakeholders, researchers in academia, and regulators will need to work together to move forward, as the materials, which are the foundation of the printing process, must be further refined to facilitate healing and use within the body over longer periods of time. 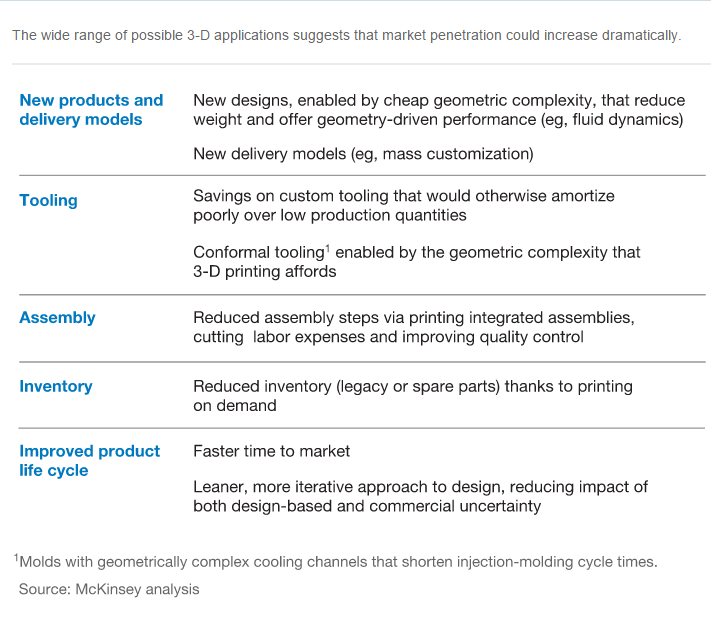 Whether you’re an engineer, designer, or technical tinkerer, here’s a basic road map to a few of the most important aspects of modern 3D printing.